• There are 168 rooms and 6 suites. • Beau Rivage Cafe, the Myako Lausanne restaurant, the Rotonde restaurant, a English bar and the Sandoz room. • Located in Lausanne Ouchy facing the lake of the Geneva. • 1857: Develpoment of small town of Ouchy below Lausanne. • 1861: Le Chalet is added. • 1877: Opening the Lausanne-Ouchy funicular connecting the shore of Lake Geneva to the Lausanne Railway station. • 1907: The name of Edouard Constant Sandoz appears for the first time among the sharholders of the « Société du Beau Rivage Palace ». Sandoz and the chemist Dr Alfred Kern were the founders of the world known pharma empire Sandoz fonded is Basel in 1886. • 1908: The palace is rebuit in a neo-baroque style with the architectes Jost, Bezencenet et Schnell. Stained windows are added to the staircase by the decorator CHIARA, they are identical to thoses used at the Ritz in Paris. According the the Gazette de Lausanne « The Hotel industry has produced nothing at once more beautiful in Switzerland and beyond. One of the masterpieces of the Hotel is the « Sandoz Room ». The dome is a stained-glass showpiece created by Eduard Diekmann. 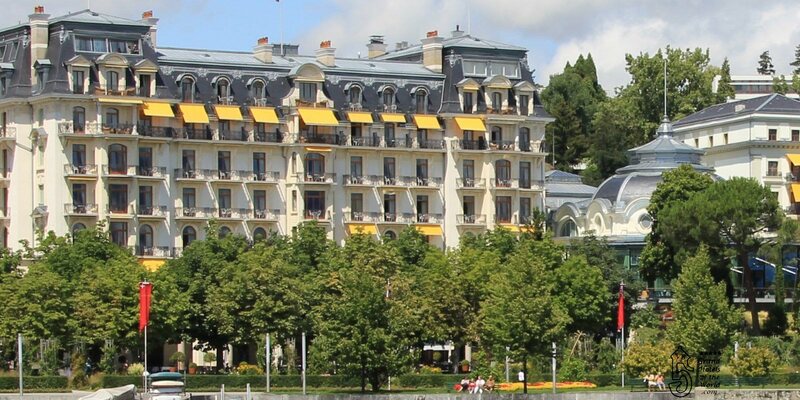 • 1922: Beau Rivage Palace is the host of the « Conference de Lausanne ». • 1945: Coco Chanel settles at the Beaurivage daydreaming about her former boyfriend, the 2nd Duke of Westminster and waiting for her return to the world of fashion in february 1954. • Ownsership: A large majority of the Hotel is still owned by the Swiss Sandoz Family, a global leader in generics (pharamceuticals). Edouard Sandoz is at the origin of Sandoz Pharmaceuticals, which in 1996 merged with Ciba Geigy to become Novartis. The family has made an unreserved commitment to maintain the hotel complex at it’s outstanding level.